The Countdown Continues: 7th Best All Time Song! The countdown continues! This song has saved me countless times. In fact, I can rarely get through this song without tearing up or outright crying. REM does not know the public service they achieved when they recorded this wonderful song that also bears a cover shout out by “The Corrs” with Bono. It is a song about something everyone can relate to……. pain. 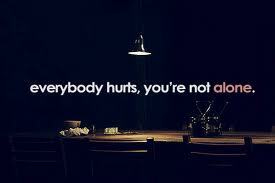 Anyone that knows me knows I am an expert at pain but this song is not about physical pain it is about emotional pain. Unfortunately, I am also an expert at that kind of pain. This song lets us know….. we are not alone in our turbulent ride through various emotional upheavals that life throws at us. The last decade + a few years has been the most tumultuous time in my life! I have had more major (unpleasant) life events ….. a (bad, bad) divorce, bad turn for my illness, nearly died with a perforated intestine and if it were not for a really good surgeon who retired the next year (and I am not embellishing…. look up duodenal ulcer with perforated intestine and see with the prognosis is without surgery), my goose would have been cooked. I spent three days in ICU and five days with an NG tube the most miserable thing ever invented in medicine. I lost my job when I ate up my FMLA time due to my illness and have been fighting over 2 1/2 years for my disability so my husband works all his jobs…. without complaint…. to keep the lights on, a roof over our head, etc. His priority is to God first of course, me and he even volunteers for the church… though he did have to cut back to once a month on that. Do I love that man. He had never made me feel foolish or dumb. He has never made fun of me or made me feel like my jobs were any less important than his (though he has an esteemed degree and is a brilliant computer programmer). Paul Glover is genius but would never ever let anyone know it. I have *never* seen a problem he could not solve, but he is in no way, shape or form ever arrogant in regards to his intelligence. So through this hell and fighting battles I just cannot win (things I will not even touch on), there has been Paul. And this song. This song has probably prevented as many suicides as any suicide hotline. 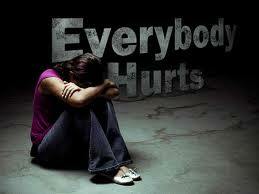 Yes, everybody does hurt….. and pretty bad at times. It does not make us weak, it makes us human. People that act like they are ‘all that’…. smug…… better than others, I have no tolerance for that. We are all equal in the eyes of God and if you are not a believer in a higher power, we are all equal because we are all human beings…. no one human whether it be the Queen of England to the poorest of the poor in a third world country is any better than the other. Even if you do not believe there is anything after this life (and I have over 100 recordings to prove…. there is more after this life)….. we are born and just because we are born and a human being, we are important and no one of us is any better than the next. We each have different styles. We have different spiritual and political beliefs, we parent different (and this one really is a way to lose my respect)…. we need to respect parents (with the *exception* of abuse, to parent the way *they* see fit). We are not putting a transmission in a car, we are raising children here and when they go off to college they are not going to care if they wore disposable diapers or cloth, if they had designer clothes or 2nd hand and a bunch of other sacred cows I will not touch. I actually joined a closed group with mothers of babies (regarding a certain subject) on Face Book so I myself could vent about an issue in private as to not get in an argument with friends that I love and adore! I have not dealt with this particular thing for 20 years, but in order to not say something I regret, I made myself a member to have a safe place I can go to ‘scream’ when it all gets to be too much. But life should not be this hard! It is hard enough to have to have your husband help you out of bed each morning…. and you are not even 50 years old yet! But it is. So, back to the song and the story goes: I am not going to pretend that there has never been a time or place that I have not considered ending my own life, I honestly do not think anyone with very progressed fibromyalgia has not entertained that thought on more than one occasion. However the pain it would cause my husband and the heartbreak it would put him through after all he does for me? No. Furthermore, it is not my call…. it is God’s. God has a plan for each of us. How do I know a new protocol or even a cure is not right around the corner? Most of all, my Grandchildren…… I want to see them grow up! They are the center of my world. So if for no other reason, I strive forward for them! So remember…. 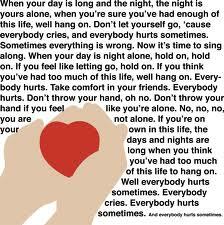 hang in there, because everybody hurts! And it will get better…. so I present to you, my pick for the 7th best song of all time…. 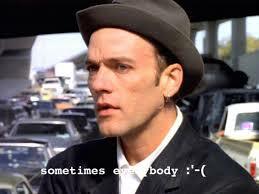 “Everybody Hurts” by REM. It is a FABULOUS video too! Enjoy! It Is Here!!!! My Pick for the Best #1 Song Of All Time!!!!! The 2nd Best Song Ever: A Personal Journey Song! The 3rd Greatest Song! It is Autobiographical! Home Stretch! The 4th Best Song Of All Time! kelli on Special Post: Gut Reaction Nashville Style! Amber on Special Post: Gut Reaction Nashville Style! how to make a solar cell on The 11th Greatest Song Ever and Boy Is This Song GOOD! Melania Sarber on From Both Sides, Now!!!!! tiket murah on From Both Sides, Now!!!! !